Brothers, we must be one as the English are, or we shall all be destroyed. You know our fathers had plenty of deer and skins and our plains were full of game and turkeys, and our coves and rivers were full of fish. Unfortunately for them, defeat was inevitable from the very first moment that settlers landed on their shores. At first, Native Americans were unaware of the danger the settlers posed, so they welcomed and assisted the first settlers. It did not take long for Native Americans to realize the danger the colonists posed to their way of life, indeed, to their very existence. Once Native Americans realized the danger the settlers posed, their attitudes toward the settlers changed from friendly to antagonistic. Native Americans were unable to comprehend the concept of individuals owning land and as a result Native American leaders constantly underestimated colonists in all their interactions with them. Conversely, the first colonists saw a land of enormous riches inhabited by a race of people, who needed to be conquered, civilized, Christianized, and placed on small tracts of land where they could become farmers. Inevitably, this led to armed conflicts between the two races that would span four centuries (Special Subcommittee on Indian Education, 1969). Why will you take by force what you may obtain by love? Why will you destroy us who supply you with food? What can you get by war? . . . We are unarmed, and willing to give you what you ask, if you come in a friendly manner. . . . I am not so simple as not to know it is better to eat good meat, sleep comfortably, live quietly with my women and children, laugh and be merry with the English, and being their friend, trade for their copper and hatchets, than to run away from them. . . .
Relations between the settlers and Native Americans improved when John Rolfe married Powhatan's daughter, Pocahontas. The two sides coexisted peacefully until her death in 1617. When Powhatan died a year later, a new chief, Opechancanough, pretended to become Christianized and allowed more colonists to settle on Native lands. He lulled them into thinking they were safe; then in March 1622, he launched a surprise attack on the settlers, killing 350 colonists - nearly one third of the population. Warfare between the races continued for another decade, with the settlers giving up any pretense of coexisting with the Indians and embarking upon a policy of extermination. The tribes revolted again in 1644; however, by then the colony had grown too large for them to be a threat to its existence (The Powhatan Confederacy, n.d.). Starting with this 12-year conflict (1622-34) between the Powhatan Confederacy and the Virginia colonists, to the Wounded Knee Massacre in 1890, literally thousands of armed conflicts, skirmishes, battles, and wars would be fought between the United States and Indian tribes across the continent (Adams, 1995). The following is a representative sample of conflicts in chronological order between Native Americans and Europeans, Native Americans and colonists, and Native Americans and early U.S. citizens over a span of three centuries (Indian Wars, n.d.). 1. 1622-44 - The War between the Powhatan Confederacy and the English Colonists of Virginia took place. 2. 1637 - The Pequot War took place in present day Connecticut and Rhode Island. 3. 1675-78 - King Philip's War took place in present day Massachusetts and Rhode Island. 4. 1680-92 - The Pueblo Revolt took place in present day Arizona and New Mexico. 5. 1689-1763 - The French and Indian War where most Algonquian tribes allied with the French; the Iroquois, with the British. 1. 1711 - The Tuscarora War took place in present-day North Carolina. 2. 1715-18 - The Yamasee War took place in present-day South Carolina. 3. 1763 - Pontiac's Conspiracy took place in the present-day Ohio River Valley. 4. 1774 - Lord Dunmore's War took place in the present-day Southern Ohio River Valley. 5. 1790-94 - Old Northwest Warfare took place in present-day Ohio and Indiana. 1. 1811 - The Battle of Tippecanoe took place on the Wabash and Tippecanoe rivers in Indiana. 2. 1814 - The Creek War took place in present-day Georgia and Alabama. 3. 1816-18 - The First Seminole War took place in present-day Florida. 4. 1832 - The Black Hawk War took place in present-day northern Illinois and southwestern Wisconsin. 5. 1835-42 - The Second Seminole War took place in present-day Florida Everglades. 6. 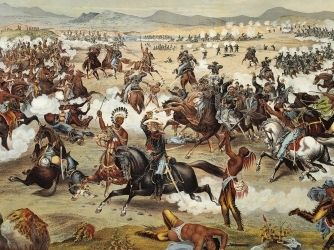 1849-63 - The Navajo Conflicts took place in present-day Arizona and New Mexico. 7. 1854-90 - The Sioux Wars took place in present-day Wyoming, Minnesota, and South Dakota. 8. 1855-58 - The Third Seminole War took place in present-day Florida Everglades. 9. 1861-1900 - The Apache Attacks took place in present-day New Mexico, Arizona, Texas, and Mexico. 10. 1865-68 and 1879 - The Ute Wars took place in present-day Utah. 11. 1872-73 - The Modoc War took place in present-day northern California and southern Oregon. 12. 1874-75 - The Red River War took place in present-day northwestern Texas. 13. 1876 - The Battle of the Rosebud took place on the Rosebud Creek in present‑day southern Montana. 14. 1876 - The Battle of the Little Bighorn took place in present-day southern Montana. 15. 1877 - The Nez Percé War took place in present-day Oregon, Idaho, and Montana. 16. 1890 - The Wounded Knee Massacre took place in present-day South Dakota. All the conflicts, skirmishes, raids, uprisings, battles, and wars were fought for one reason only: Indians possess the land, and the whites wanted the land (Adams, 1995).